Not everyone can successfully download and install iOS 11 developer beta on their iPhone. Some users have encountered problems during upgrading process. The most common issue is iPhone frozen on Apple logo screen and won’t restore normally after iOS 11 update. Don’t worry too much about it, still not that bad yet. Here are 4 tips you can take to fix iPhone X/8/7/7 Plus/SE/6s/6/5s stuck at Apple logo without data loss when updating to iOS 11.2 Beta, iOS 11.1/11.0.3/11.0.2. Yes, you read that right. The simplest way to work out iOS 11 stuck on Apple logo is to restart your device, though the little trick won’t help much to troubleshoot this particular problem most of the time. Anyway, there is no harm to force restart your iPhone. Long press the Wake/Sleep button and home button on iPhone (Volume Down button on iPhone 7 or later) until the device to reboot again. If your iPhone stuck on Apple logo during upgrade iOS 11 developer beta for more than several minutes, you can put iOS device in recovery mode and restore it with iTunes. Before start, make sure that iTunes is up to date. Enter Recovery Mode by pressing and holding Sleep/Wake and home button for more than 10 seconds on iPhone 6s Plus/6s/5/5s until Connect to iTunes screen shows. Or Sleep/Wake and Volume Down button on an iPhone 7 or later. 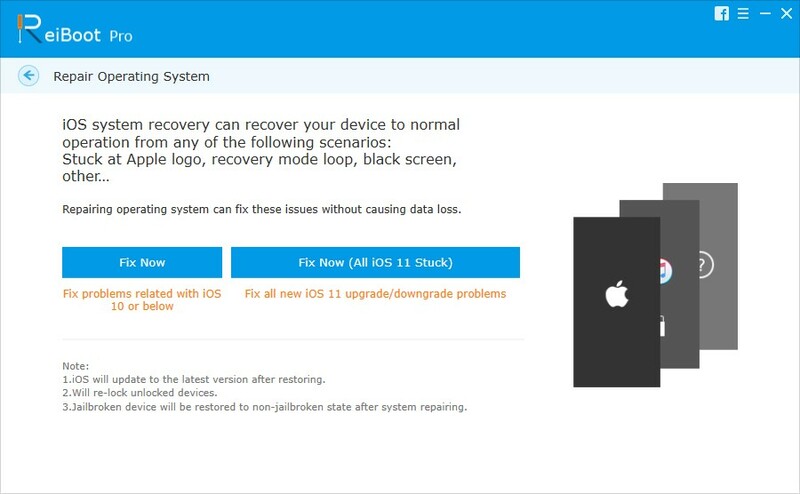 When detected iPhone in Recovery Mode, iTunes will ask whether to Restore or Update. Of course, since iOS 11 beta is the newest update already, let’s click Restore here. Note that it will perform a factory setting and erase all media and data from your iPhone. 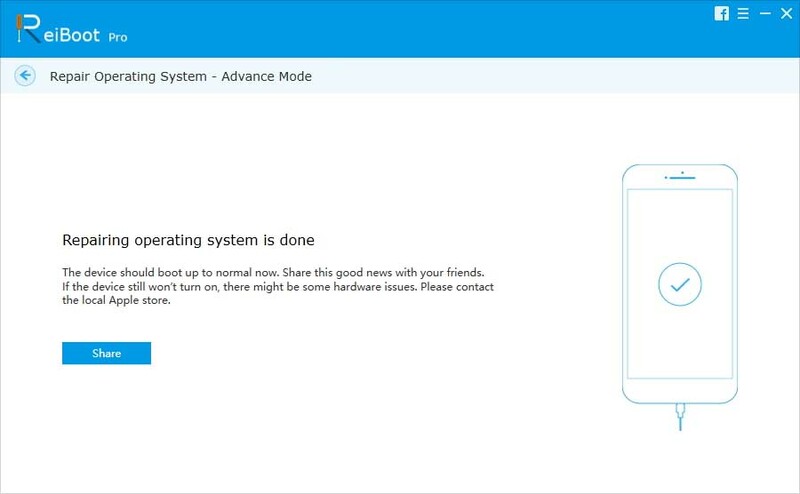 Tip: If you happen to have the broken Power button or Home button, to get out off iPhone stuck on white/black Apple logo, you can try free Tenorshare ReiBoot to 1-click enter and exit Recovery mode without any data loss. Still, begin by connecting iPhone with iTunes on your computer. Shut down your device completely. Then hold the power button for 3 seconds. After 3 seconds passed, press and hold both Sleep/Wake and Home button for about 10 seconds (If you own an iPhone 7 or newer iPhone, the combination is Volume Down and Home button). Release the On/Off button but continue holding Home button on iPhone 6s earlier or Volume Down on iPhone 7 or later. Please refer to below illustrated guide if you didn’t get the words. 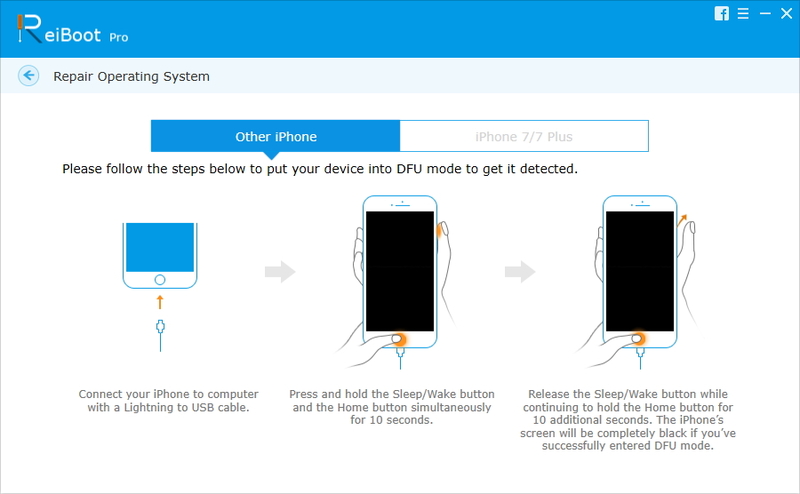 If the screen stays black, it means you have successfully entered DFU mode, and if anything showed, like Apple logo, Connect to iTunes prompt, you will need to try again. Restore iPhone from frozen white Apple logo with iTunes. Same as what you did in method 2. Considering iTunes will erase all settings and content from iPhone, you are recommended to use ReiBoot to recover iPhone bricked after iOS 11 update. By default ReiBoot will provide you with the latest available firmware package as a replacement of the crashed iOS 11 developer beta. 1. Download and install the iOS repair tool on your PC/Mac and connect your device with it. 2. 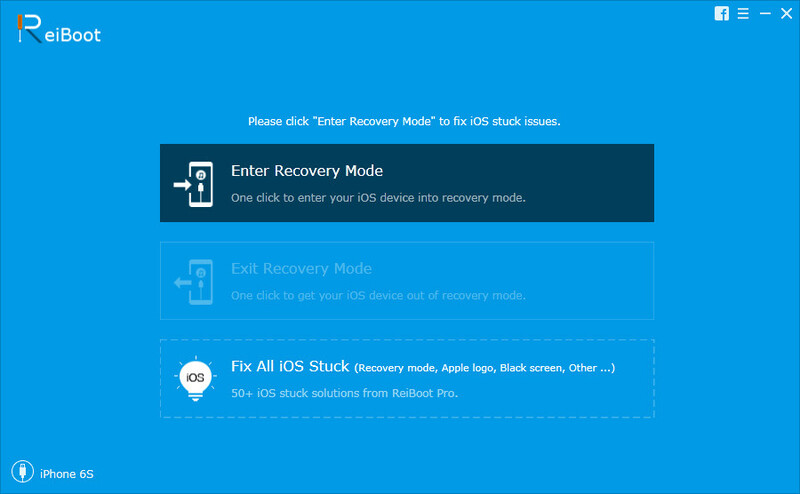 Choose Fix All iOS Stuck on the homepage, and follow to instructions to move on. 3. 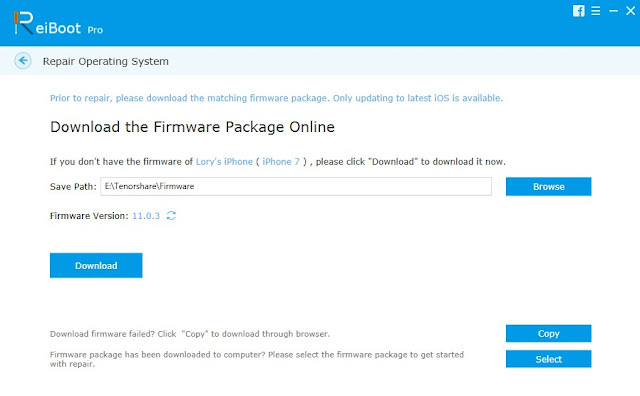 Download iOS 10.3.2 firmware package online or import one manually if you have obtained. The downloading process may take a while for the package is about 2.5 GB. 4. Once the iOS firmware package is downloaded, click Start Repair and wait for the repairing process done, you will be able to reboot the device and get rid of iPhone stuck in Apple logo iOS 11. Hope you can find a handy solution here. If you are unlucky to wipe out all data when fixing iOS 11 stuck on iPhone, you can resort to UltData to recover lost messages, contacts, notes, photos, videos and etc.